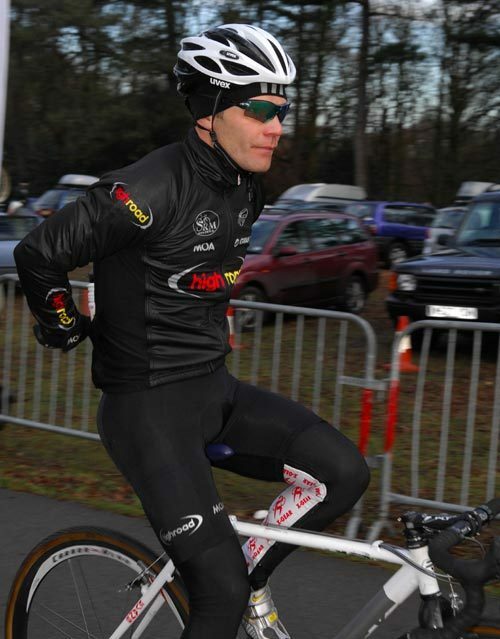 Roger Hammond showed off the new Team High Road kit at the British National Cyclo-Cross Championships in Birmingham at the weekend. Gone has the lurid and highly visible Euro pink of the T-Mobile kit to be replaced with austere black and grey of Team High Road. When the German telecommunications giant pulled out of sponsoring the ProTour squad in November after a series of doping revelations, the team’s management company – High Road Sports Inc. – effectively became title sponsor. Compared to some of the team strips doing the rounds, the Team High Road jersey is almost completely bare of sponsors’ names. Only Giant, who provide the squad with bicycles, are an instantly recognisable name on the strip. But even they are tucked away just below the neck line. High Road have obviously taken a conscious decision to make a clean (sorry) break with the past, leaving behind any resemblance to the old squad. Is black boring? Is it classy? The change in kit obviously hasn’t done Hammond any harm – he won the National Cyclo-Cross Championships, taking his tally of national cross titles to eight. Hammond and former T-Mobile team-mate Mark Cavendish are joined by Cofidis convert Bradley Wiggins for the 2008 season to make a trio of Brits at Team High Road. The team’s first ProTour outing will be over January 22-27 at the Tour Down Under in Australia. What do you think of Team High Road’s new kit? Vote in this week’s homepage poll.